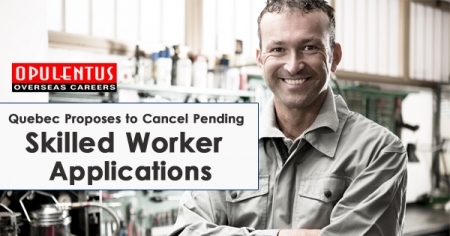 On Feb 7, 2019, the Quebec Immigration, Diversity, and Inclusiveness Minister tabled intended legislation that will remove all pending skilled worker appeals that have not decided before Aug 2, 2018. Bill 9 titled “To improve Québec’s socio-economic success and to answer appropriately to the requirements of the labor market by the victorious integration of immigrants,” will undergo additional study in the Quebec National Assembly. Once moved by MP’s and accepted by the Quebec Lieutenant Governor, it will convert as law. The new bill intends to pay government fees to all the applicants who are affected. Quebec is mired in the discussion as higher than 50,000 people representing 18,000 principal applicants, along with their dependents, who applied below the program of Quebec Skilled Worker, anticipate processing of their incomplete applications. The present government of Quebec, the Coalition Avenir du Quebec, (CAQ) swept to power in Oct 2018 below a platform to decrease levels of economic immigration by 20%. The CAQ states it wants to decrease immigration momentarily so that the integrating process of current immigrants can be increased. The current law will put a permanent closure to plenty of applications. With much of Quebec suffering severe labor deficits, opponents to the policies of government say the province is in desperate need of improved immigration, especially in the Economic Class. The CAQ’s progress to push forward with the decreased immigration levels comes despite a notice from Justin Trudeau, Canadian Prime Minister. On a federal level, Ottawa declared in Oct 2018 plans to grow immigration to 350,000 immigrants per year by the year 2021. In Aug 2018, Quebec executed an immigration system of Expression of Interest below its Quebec Skilled Worker program, known as Arrima. It works similarly as the Express Entry system and substitutes the previous process of first-come, first served. The initial draw below this new system has not yet taken place. Bill 9 will not influence candidates who provided profiles below this new EOI system.